I was on Groote Eylandt in November 2015, and I was eager to catch up with one of the new generation of church leaders. The word was that he had moved from a different community a couple of months ago, but that he hadn’t been seen by any of the Groote churchgoers. After some asking around, I learned that he was still on Groote and I was directed to his house in the late afternoon, a good time for visiting. I drove up the driveway and blasted the car horn in the culturally appropriate way. No response. So I decided to be counter-cultural and walk up to the house, knock on the door and call out. Still no response, but the next-door neighbour called out that he was indeed home. So, unsure as to how long to persist, I kept calling out. When he finally emerged, I discovered that I had woken him from sleep. He was home alone, because his wife and children had gone interstate for a relative’s funeral. Apart from being sleepy, he was delighted to see me, and said that although he had gone through something difficult, he was on track with God, praying, singing songs, and reading his Bible. It was an encouraging visit. This story brings home to me a number of challenges in ministry with the Aboriginal churches of Northern Australia. There is the awkwardness of being out of my cultural comfort zone. There are difficulties in communication and expectation. There is the problem of a new free market for church, when until recently there was only one denomination in any Aboriginal community. There is the frequent observation (not confined to Aboriginal people!) that the Christian life is two steps forward and one step back. Yet at the heart of this story, there is a young man who is committed to the Christian life, but whose chances for being discipled are very limited. There are two other young men in the same community, who, with their wives are potential leaders of the church. Actually, there are no other potential leaders yet – these ones are the only representatives of their generation who are connected with the Anglican Church, and they rarely come to the Sunday service. 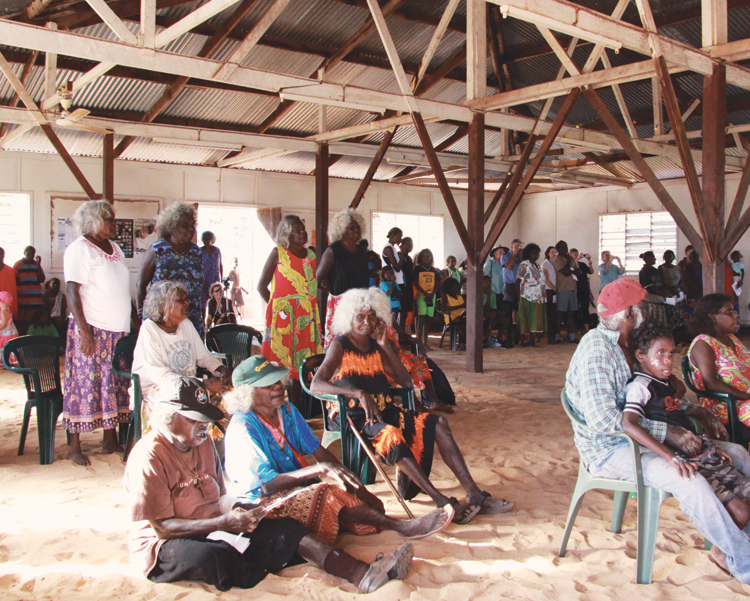 Evening fellowship meetings – one of the main expressions of Christian identity in many Aboriginal communities – are not happening much at present either. This is discouraging for the deacon-in-charge, who is the widow of the first Aboriginal minister there. She, like many in her generation, has shown remarkable perseverance in the Christian life, despite great difficulty. As I spoke with the deacon-in-charge, we agreed that fresh input is needed if the church is to grow. So I said I’d go to the missionary shop and buy some, or the missionary orchard and pick some. We laughed. If the potential leaders are to become actual leaders, they need good, frequent and regular discipling, and it is difficult to see the churches on Groote having adequate capacity to do that at present on their own. How long can churches survive when role models are so thin on the ground that people struggle to know what living as a follower of Jesus looks like? Quite a lot of what happens in the Aboriginal churches in North Australia follows a pattern based on the assumption that few people having meaningful employment. Sadly, that assumption is correct. Ministers are not being paid, because most of the population is on Centrelink, including the ministers. On the other hand, when potential or actual leaders do have jobs it means that it is hard for them to participate in church leader training, whether at Nungalinya College, at a diocesan-organised training workshop, or in their own community. The kind of people who make good church leaders are also the kind of people who are headhunted for jobs by government and other agencies. This makes discipling all the more important – and challenging. As well as discipling, there is a huge need for evangelism, in culturally meaningful ways. For that to happen well, Christian resources in Aboriginal languages are needed, because English doesn’t work well for many people. It is vital for Aboriginal people in North Australia to understand that Christian faith is about what God has done for them in Jesus Christ rather than being somehow confused with other stories and behaviours that Europeans brought to this continent. There is still lack of clarity within remote Aboriginal communities about many aspects of the mainstream Australian world, such as health, money and work. This leaves Aboriginal Christians disempowered and marginalised. In light of the many challenges facing Aboriginal Christians, we need to find people who are willing and able to bridge across cultures, to interpret each side to the other. This is likely to require at least medium-term commitment, preparedness to do language study, and openness to learning from others. CMS has strongly reiterated its commitment to the Aboriginal church in North Australia. It has listened to Aboriginal Christians, who are looking for workers who can be involved in training people for children’s and youth ministry, supporting Christian women leaders, and raising up Christian male leadership. To achieve this, CMS is actively seeking more people to go as missionaries to fill these roles. Some of these workers may serve in full-time ministry roles. Others may have skills that enable them to have ‘secular’ jobs in an Aboriginal community, where they can stand alongside local Christians. What is most important is that they are willing to ‘be with’ (not ‘be over’) Aboriginal people, building capacity for the long term in growing disciples of Jesus. Are you that person? One of CMS’s longest-serving missionaries in the North has often remarked that ministry here is ‘not for the squeamish’. There are many challenges in this work, but the greater challenge is to find people who under God are willing to go and bear witness. We have a great story to share: all humans have the dignity of being made in God’s image, and we have hope because Jesus’ death and resurrection rescue us from sin and death. Please pray that God will provide for North Australia spiritual farmers who will plant seeds of the good news of Jesus, spiritual watering cans to water that seed, and spiritual reapers for the harvest.